Warhammer: End Times – Vermintide is a first-person video game developed and published by Fatshark. The game is set in the Warhammer Fantasy universe. It was released for Microsoft Windows on October 23, 2015 and was released for PlayStation 4 and Xbox One on October 4, 2016. The game is multiplayer-only, and its structure is similar to Valve's Left 4 Dead series. Set in the End Times, players can team up with three other players to fight against the Skaven, a race of rodent-like monstrous creatures, in the city of Ubersreik. At the end of each match, the players are given the opportunity to roll dice, which determine the weapons they will receive as reward. The development of the game began in early 2013 in Fatshark, after the company came to an agreement with Games Workshop. Games Workshop also collaborated with them to ensure the game is faithful to the Warhammer franchise. The game was self-published as they wanted to maximize their creative freedom. It was labelled by PC Gamer as the best game of Penny Arcade Expo. The game received generally positive reviews upon release. Critics liked the game's gameplay, progression system, visuals and map design, while criticizing the game's balancing issues and occasionally technical issues. The game was supported by both paid and free downloadable content and sold 300,000 copies within a month. A sequel titled Warhammer: Vermintide 2 was released for Windows on March 8, 2018. A gameplay screenshot of the game, showing the player character using a crossbow to kill the Skaven, a race of rodent-like monstrous creatures, outside the city of Ubersreik. Warhammer: End Times - Vermintide is a co-op-focused first-person shooter action video game set within the Warhammer universe. Set in the End Times, players can team up with three other players to fight against the Skaven, a race of rodent-like monstrous creatures, in the city of Ubersreik. Players can choose from five different heroes — the Witch Hunter, Empire Soldier, Dwarf Ranger, Waywatcher and Bright Wizard. The five heroes have different skills. Some are more efficient in performing ranged attacks such as using firearms and arrows or casting magic, while some are more capable in using melee weapons like swords. At the end of each level, players will be awarded loot, such as trinkets and weapons. They also gain experience points to unlock weapons and are given the chance to roll dice. The dice players roll will determine the new gadgets they will receive. Different characters have different loot, and at high difficulty, the amount of loot rewarded is greater. The game's design is similar to that of Left 4 Dead, in which players are tasked to fight off hordes of enemies in order to progress from one side of a level to another. There are several types of Skaven featured in the game. The most common type can be easily killed but they often come with a vast number to overwhelm players. The more elite ones include Skaven that are protected with heavy armor and Skaven that are equipped with toxic bombs. The artificial intelligence featured in the game is dynamic, with hostile enemies spawning randomly. This mechanic is known as the "conflict director". The game also features a real-time narrative, which slowly unfolds as players progress through levels. Each character has their own personality and attitude towards the major events in the game. Warhammer: End Times - Vermintide was developed by Fatshark, who had previously developed War of the Roses. According to Fatshark, the team had wanted to make a Warhammer game since they played Warhammer Fantasy Battle in 2004, but they lacked the team to do so. The studio was originally very small, but its size grew shortly afterwards after the closure of Amuze, in which a lot of its employees joined Fatshark. After the company's expansion, the team decided to approach Games Workshop for the Warhammer license in 2013, and their offer was accepted. Production of the game began in the beginning of that year. According to Fatshark, having Games Workshop as a coordinator for their project was a "dream come true" for them. In order to be faithful to the franchise, the two companies worked closely together so as to ensure that their creative visions would not contradict with each other, and to confirm that the game had a "Warhammer feel". They also decided to self-publish the game, so that they can maximize their creative freedom. 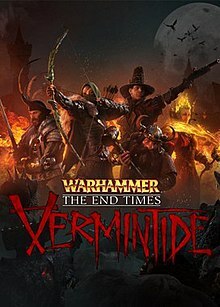 Vermintide was also the first game where the entire team at Fatshark worked together, and it enjoyed a much longer pre-production and production period than their previous projects. The company had experimented with games like Escape Dead Island and Krater, and realized that among all the genres, the team are most capable in developing multiplayer games with co-operative gameplay, and they decided to specialize in it. Vermintide's main focus is co-op, and most gameplay features are built to enhance the experience and its replayability. According to the team, it is a game about surviving the apocalypse in the End Times. Therefore, they incorporated elements from Left 4 Dead in which players must work together to achieve success. Loot is given to players only when the main quests are completed. The team made this choice because they thought they should not award players for their mistakes. Enemies are designed to spawn in vast number, as the team thought that such large quantity can help these enemies to become the "perfect enemy for a co-op game". However, despite being co-op focused, players cannot play as typical fantasy characters like healers. Therefore, Fatshark decided to name these characters "heroes" instead of "classes". The game's gameplay is a combination of melee gameplay and gunplay, which the team thought can craft a "visceral" experience for players. In order to prevent players from rushing through levels and pick on every enemy, they included enemies that should be evaded, such as some of the Elite units, and gameplay segments where players should carry out stealth. They hoped that through this approach, players can think and plan their moves accordingly and ultimately work together to prevent getting killed, as well as temporarily breaking the flow of actions. The game was announced on February 5, 2015 with the release of an announcement trailer. The game was released for Microsoft Windows on October 23, 2015. The game is also set to release for PlayStation 4 and Xbox One in the fourth quarter of 2016. On December 3, Fatshark released the first content update titled Sigmar's Blessing for free to all owners of Vermintide. The update added 40 new weapons in a new tier called Veteran, as well as the Shrine of Solace which acts as a new way for players to spend their Salvage Tokens and gain weapons. Patch 1.1.5 was released on January 26, 2016, and added the ability to re-roll traits as well as upgrade their percentage to activate. Both of these uses the Salvage Tokens as their currency. Patch 1.2, titled Last Stand, was released on March 7, 2016. It added a new endgame mode sharing the title of the update, Last Stand, in which the players battle an unending tide of vermin. As time goes on, the waves of enemies become bigger and stronger, increasing the difficulty. The players are rewarded by picking up Badges which spawn after certain waves around the level. The game mode was released for free along with one compatible level, titled Town Meeting. Town Meeting takes place in an area named Von Jungfreudsplayz which players have visited in a previous level. Patch 1.2 also contained a paid DLC level compatible with Last Stand named The Fall. The Fall takes place in Schlusselschloss, a ruined castle who used to stand guard against what might come through the mountain pass into Reikland. On May 4, Fatshark unveiled their next paid DLC called Drachenfels. It will contain three new levels and new weapons for two of the playable characters. Drachenfels is set for release on May 26, 2016. PC Gamer played the game at PAX Prime 2015 and awarded it the "Best game of PAX", stating that "What’s surprising about Vermintide, and absolutely central to its appeal, is how fresh it feels despite its deep similarities to Left 4 Dead." Upon release, the game was met with positive responses. The game's co-operative nature received acclaim. Ian Birnbaum from PC Gamer called it the best co-operative multiplayer game to date since Left 4 Dead 2. He added that players staying together is essential, saying that it has successfully encouraged players to co-operate with each other. Dan Whitehead called the game "a thrilling twist on Left 4 Dead's co-operative action" but he is disappointed that the studio had not taken further risks to shape the game's identity. Joe Parlock from Destructoid echoed similar thoughts, noting the game's similarity with the Left 4 Dead franchise. Rob Zacny thought that the game was competent, but he thought that the game was not executed well, saying that it does not achieve the same height as the Left 4 Dead series does. He also added that the game lacks tension. The game's gameplay was praised. Birnbaum thought that the combat system is simpler than Fatshark's previous game, but he added that the game's simplicity is one of its strengths, as it enhances the "solidity" of the combat system. He also thought that all the characters featured in the game are unique, and none of them are boring. Parlock also praised the five classes, writing that their power feel very balanced. He also liked the game's combat, which he thought was involved, albeit simple. Whitehead thought that the game is satisfying and very fun to play. The progression system was also praised by him, as he considered that it has successfully given players motivation to play the game. Zacny also praised the progression system, saying that it encourages players to try some of the game's more difficult missions and segments. Scott Butterworth from GameSpot also admired the progression system, saying that it adds twists to the co-operative formula. However, he noted that characters in the game move too slow when compared to the fast action featured. However, the game was criticized for its balancing issues. Whitehead noted that some of its maps are frustratingly difficult, and that the upgrades featured in the game do not correspond with the gadgets players own. Both Whitehead and Parlock noted that the game suffered from occasional bugs and glitches as well as other kinds of technical problems. Butterworth disliked the game's artificial intelligence, calling them unreliable. It has sold over 300,000 copies as of November 11, 2015. Fatshark also announced that the game will be supported by multiple downloadable content, with the first one being Sigmar’s Blessing, which adds new loot. It was released on December 3, 2015. On April 1, 2016, Fatshark announced that the game's sales surpassed 500,000 units. A sequel titled Warhammer: Vermintide 2 was unveiled in late 2017. It was released on March 8, 2018. ^ a b c Makuch, Eddie (February 5, 2015). "Warhammer End Times Revealed, Coming to Xbox One, PS4, and PC". GameSpot. Retrieved November 14, 2015. ^ a b c Fillari, Alessandro (March 3, 2015). "Warhammer: End Times - Vermintide goes all in with hectic co-op action". Destructoid. Retrieved November 14, 2015. ^ Hillier, Brenna (September 29, 2015). "The Waywatcher in Warhammer: End Times – Vermintide is a total badass". VG247. Retrieved November 14, 2015. ^ Orry, James (February 5, 2015). "Warhammer: End Times – Vermintide is a co-op FPS coming to PS4, Xbox One & PC in 2015". VideoGamer.com. Retrieved November 14, 2015. ^ Gregory, Jon (February 24, 2015). "First Look At Warhammer: End Times – Vermintide". Game Informer. Retrieved November 14, 2015. ^ a b c d e Whitehead, Dan (October 27, 2015). "Warhammer: The End Times - Vermintide review". Eurogamer. Retrieved December 6, 2015. ^ Lathi, Evan (August 31, 2015). "Warhammer: End Times - Vermintide was the best game at PAX". PC Gamer. Retrieved November 14, 2015. ^ a b c d e Lemne, Bengt (February 24, 2015). "We paid Fatshark a visit in Stockholm to take a look at their most ambitious project to date where Left 4 Dead meets Warhammer's End Times". Gamereactor. Retrieved November 14, 2015. ^ Yin-Poole, Wesley (March 4, 2015). "Warhammer: End Times Vermintide debut gameplay video released". Eurogamer. Retrieved November 14, 2015. ^ Potter, Matt (February 5, 2015). "Warhammer: End Times — Vermintide Announced". IGN. Retrieved November 14, 2015. ^ a b Wahlund, Martin (February 5, 2015). "Warhammer: End Times – Vermintide unveiled for PS4". PlayStation Blog. Retrieved November 14, 2015. ^ a b c Lathi, Evan (February 24, 2015). "Warhammer: End Times - Vermintide preview: Building a better mouse trap". PC Gamer. Retrieved November 14, 2015. ^ Yin-Poole, Wesley (September 24, 2015). "Warhammer: End Times Vermintide sinks its teeth into Steam in October". Eurogamer. Retrieved November 14, 2015. ^ Morrison, Angus (December 3, 2015). "Vermintide buffed with free Sigmar's Blessing DLC". PC Gamer. Retrieved December 3, 2015. ^ Morrison, Angus (March 8, 2016). "Vermintide swells with free Last Stand DLC". PC Gamer. Retrieved March 8, 2016. ^ Chalk, Andy (May 4, 2016). "Warhammer: Vermintide DLC adds maps, traps, and even more Skaven". PC Gamer. Retrieved May 4, 2016. ^ a b "Warhammer: End Times - Vermintide for PC Reviews". Metacritic. CBS Interactive. Retrieved February 14, 2019. ^ "Warhammer: End Times - Vermintide for PlayStation 4 Reviews". Metacritic. CBS Interactive. Retrieved February 14, 2019. ^ "Warhammer: End Times - Vermintide for Xbox One Reviews". Metacritic. CBS Interactive. Retrieved February 14, 2019. ^ a b c Parlock, Joe (October 26, 2015). "Review: Warhammer: End Times — Vermintide". Destructoid. Retrieved December 6, 2015. ^ a b c Butterworth, Scott (November 9, 2015). "Warhammer: End Times — Vermintide review". GameSpot. Retrieved December 6, 2015. ^ a b c d Zacny, Rob (October 28, 2015). "Warhammer: End Times — Vermintide review". IGN. Retrieved December 6, 2015. ^ a b c Birnbaum, Ian (October 29, 2015). "Warhammer: End Times — Vermintide review". PC Gamer. Retrieved December 6, 2015. ^ Lathi, Evan (August 21, 2015). "Warhammer: End Times - Vermintide was the best game at PAX". PC Gamer. Retrieved December 6, 2015. ^ Parlock, Joe (12 November 2015). "Vermintide sold 300K copies since launch, here are details on future DLC". Destructoid. Retrieved 12 November 2015. ^ Nunneley, Stephany (November 11, 2015). "Warhammer: End Times – Vermintide has sold 300,000 – free DLC announced". VG247. Retrieved December 6, 2015. ^ Jarvis, Matthew (April 1, 2016). "Fatshark's Warhammer: End Times - Vermintide passes 500,000 sales". Develop. Retrieved April 1, 2016. ^ "Warhammer: Vermintide 2 Reveal". Retrieved 4 January 2018. ^ Hallam, Chris (18 October 2017). "Warhammer: Vermintide 2 won't have any paid loot boxes". VideoGamer.com. Retrieved 18 October 2017.